Prototype: Class 1200 heavy general-purpose locomotive. The locomotive is in the basic blue paint scheme with yellow stripes for the firm ACTS, used on the Dutch State Railways (NS). 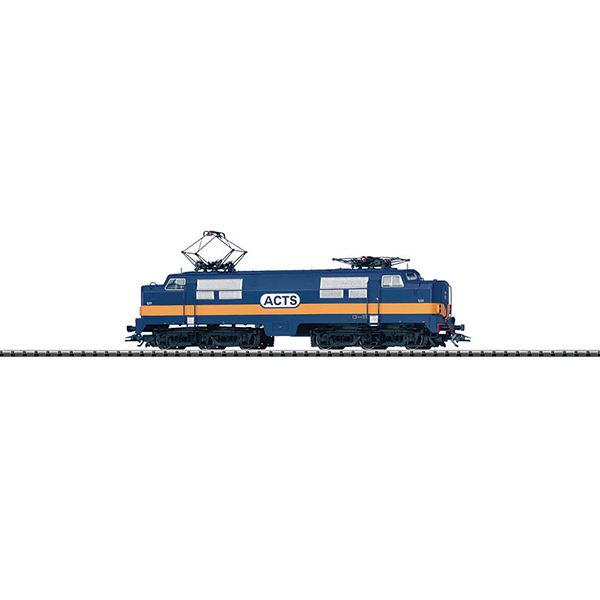 Use: Passenger trains and heavy freight trains. Model: Era V. The locomotive frame and boiler are die-cast metal. The locomotive has a digital decoder for DCC, Selectrix, and Trix Systems; it can also be used conventionally. The locomotive has a 5-pole motor. 2 axles powered. 2 traction tires. The headlights are maintenance-free, warm white LEDs; the marker lights are LEDs. They will work in conventional operation and can be controlled digitally. The horn sound effect as well as the acceleration and braking delay can be controlled digitally. Brake hoses can be mounted on the buffer beam. The locomotive has NEM coupler pockets. Length over the buffers 208 mm / 8-3/16. This model can be found in an AC version in the Marklin H0 assortment under item no. 37122.